As I walked into the gold mosaic tiled Spa reception area, located in the subterranean levels of the gorgeous Four Seasons Ten Trinity Square I instantly felt relaxed. Just streets away are crowds of tourists around Tower Hill, yet in the hotel I felt a total sense of serenity and calmness. The hotel is housed in the former Port of Authority building and I adore that they have retained aspects of the history of the building, be it from the cups and saucers they use for their Afternoon Tea service, or the giant book viewable just before you enter the Rotunda restaurant, where the actual deals used to take place. I have visited the hotel several times for dinner at Mei Ume, as well as for Afternoon Tea. But the Spa was a first time experience for me and I was really excited. It has a really modern design by Joseph Caspari and I just adored the domed ceilings, gold luxe interiors and elegant interiors. I was offered a refreshing tea as a welcome drink whilst I filled out the form with how I wanted to feel after my treatment. I chose relaxed and de-stressed. The treatment I had opted for was an Amala’s Personalized Massage, which is a bespoke therapy to address individual needs. A quick change in the large and spacious changing rooms into my robe and slippers and I was ready to meet my therapist and relax for the next 60 minutes in one of the eight Spa treatment rooms, which was stunning and with dark, neutral interiors. Her name was Melissa and she was absolutely lovely. I explained that I had suffered a back injury a few years ago and that if she could focus in that area it would be ideal and she was so good. I literally felt so at ease and slipped into a state of total chill whilst she massaged my body with cold pressed Energizing massage elixirs which smelt absolutely amazing too. A head massage at the end was the icing on the cake and I have to say it is probably one of the best massages I have ever experienced. After the massage she gave me a refreshing and hydrating glass of cucumber infused water to drink and then led me to the Spa relaxation rooms, where you can unwind further. I sat here for a while before heading off to try out some of the Spa’s facilities. I was most excited about the stunning 14 metre swimming pool and adjacent vitality pool, which has hydrotherapy bubbles and is just so dreamy. There are lots of sun loungers around if you want to relax by the pool too. There is also a sauna and steam room which I of course tried and it was brilliant. The facilities are state of the art and I could literally see myself here again taking time out from a stressful day and relaxing at the absolutely wonderful Spa. It has a Roman feel with the white columns and there is a reason for this. When strengthening the hotel’s foundations due to its historical past, archaeologists actually uncovered some Roman finds such as chalk-walled cellars, cesspits, animal remains and a well reinforcing the connections between Tower Hill and Roman Britain. However, I didn’t have far to go as I was headed to the stunning Rotunda bar upstairs to try some of the 1920’s inspired cocktails. Cocktails we tried were from the Flappers Dictonary Cocktails selection and I loved reading the descriptions for each one. The one I loved most was the “eddisoned” which means (to get) /e-də-ˈsō-nē-d/ verb – to be asked many questions. It was a blend of lemongrass, cranberry, tonic and ketel one, and so very refreshing. Aftab chose the “blushing violet” described as a noun to publicity hound. It even had glittery sparkle in it and was a mix of violet, white grapefruit, elder flower and sweet wine. For our next round, I opted for the “corn shredder” /kȯrn ˈʃredər – noun – young man dancing on woman’s feet. It was delicious with a piece of corn on the cob served inside it as well as corn sprouts, which the bartender encouraged me to try, and it was good! The cocktail was a blend of corn, agave, pink grapefruit and Tanqueray TEN, and really easy to drink and enjoyable. Aftab picked the “big timer” /bɪɡ taɪmər/ noun – man, romantic which was a blend of lychee, orange, lovage and Remy Martin V.S.O.P. It was served with Lychees in two different ways, one dehydrated and the other juicy, to give contrasting textures and feels. After our cocktails we headed to our favourite restaurant, Mei Ume to try the Luna Elixyr cocktail, which is a really refreshing blend of Umeshu Sake, coconut rum and pineapple. We also nibbled on a delicious selection of Dim Sum and Sushi compliments of the amazing team at Mei Ume – thank you so much! And the “icing” on the cake was the Iced Mochi, which if you haven’t tried what have you been waiting for? I had the most wonderful time at Four Seasons Ten Trinity and will be back to try more of the Spa treatments and relax in that pool very soon. If you are looking for a Spa sanctuary in the heart of the city which is luxurious and amazing, this is the one! I can’t recommend it enough. If you would like to find out more about Mei Ume, you can read my review here. I absolutely love the Chinese and Japanese dishes served here and would highly recommend it. You can find out more about Four Seasons Ten Trinity Square here. Disclaimer: My Spa treatment and cocktails were complimentary. All photos and views re my own. What a delectable treat as an afternoon! 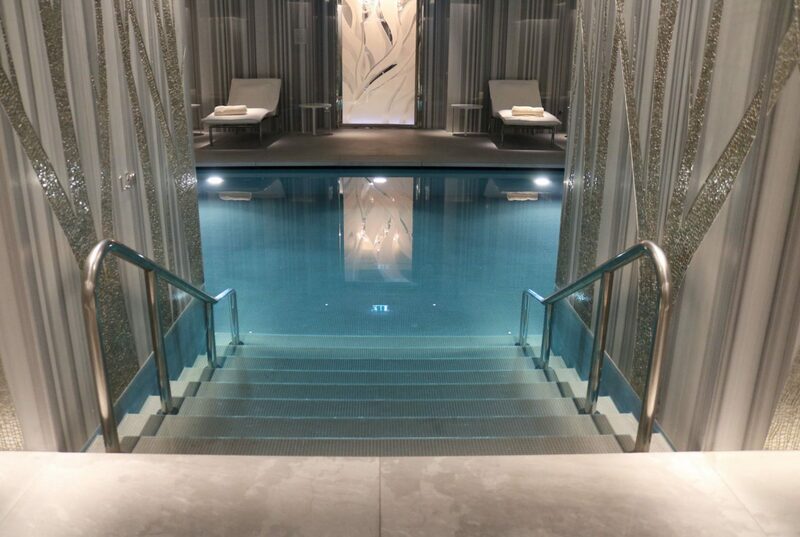 It has to be one of London’s most beautiful spas! I loved spending the afternoon with you, B! Same time again next week?